Self-drive cars are the new buzz in society. Vroom Drive specializes in providing self-drive car for outstation as well as short trips which enables the customer to hire from a plethora of variants of cars viz., hatchback, sedan and SUV models. Our self-drive car are well-maintained cars along with comfortable car accessories of choice. we have several other irresistible features which will make the journey thrilling & memorable. Self-drive cars to provide ultimate driving satisfaction with its unfathomable service. We are just a booking away to deliver the car of your choice. You pay for the kilometers used and forget about all the worries while traveling outstation. Outstation traveling is fun especially when you have the car of your preference. You fulfill your long-drive dreams and we will take care of your requisite driving needs. Get a well-maintained car of your choice. Choose accessories which best suits your travel needs. Get the car which is properly investigated and maintained to avoid any road hiccups. Flexibility to choose fuel or non-fuel vehicle as per your convenience. No more queue’s in toll gate with Fast tag facility. Replacement car facility at the time of breakdown. The 24/7 customer support team at your service. 24/7 chat support team to answer your queries. Select your car for outstation from the wide range of available models and we will home deliver happiness within Bengaluru. Pick and drop the car conveniently at any time of a day. To ensure safety, the vehicles are equipped with state-of-the-art GPS devices. Over speeding, alerts will help you to maintain the speed limit while driving on highways. All our cars are registered under All India Permit. Towing & impounding charges will be borne by us in case of vehicle failure. On-time delivery of car which is the first step towards customer satisfaction. Postpone or preponed your trip just call 24/7 customer support regarding the changes. Outstation trips definitely give an adrenaline rush but there are few dos and don’ts we should abide with for a peaceful and safe journey. Never leave your vehicle unattended if you met with an accident or breakdown unless the fleet-personnel or roadside assistance team arrives at the spot. Report the issue immediately at the 24/7 hotline or helpline number. Do read rules & regulations before commencing your trip to know more about our services and offers. An outstation trip cars should be informed prior to the 24/7 customer support team in order to ease your trip. Carry your valid driving license for hassle-free travel while entering other adjoining or neighboring states. Obtain valid State entry permit at the border RTO check post by producing Driving License and other documents provided by us in the car glove box. We at Vroom Drive striving hard to excel our services and to reach the epitome of customer satisfaction. The outstation trips along with family, friends or acquaintance should be a memorable one and our crew leaves no stone unturned to provide you best in class service. The outstation tour could be planned for a family get-together or a wedding or just an adventure trip or a rendezvous with old buddies, We will provide car for outstation at an affordable price with a personal car experience. 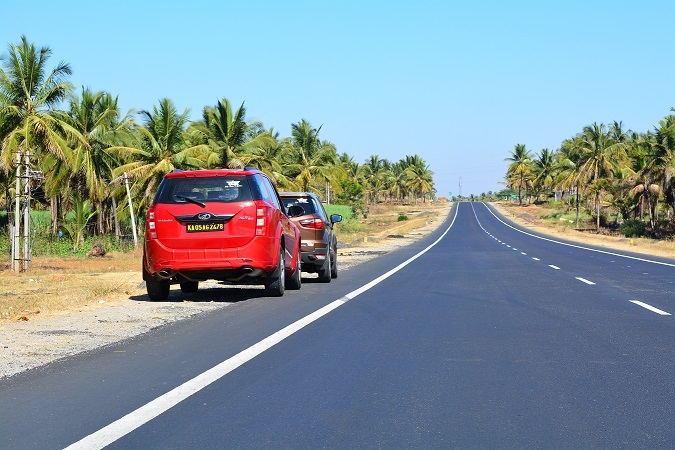 The dedicated team understands the customers need for different cars for outstation road trips. The outstation trips could be long or short trip thus our customer support team provides relevant advice to the customers in regards to the trip, to avoid any hurdles. Such as, if a customer is planning to climb hills then the SUV vehicles will be the best option. On the other hand, if the customer is looking for more mileage then our customer support team will advise accordingly to meet customer’s expectation. If a number of family members are more than it is recommended to hire 7 seater vehicle for a comfortable journey and the luggage space will be relatively more. We understands the need of the hour. Thus, provides various packages to fit the user’s requirement. We offer customized packages, with or without fuel option and much more just vroom with satisfaction and bring back the unforgettable memories which will last for the lifetime. Contact our team today to hire a self drive car rental for outstation destination at an affordable price with uncompromised comfort.